It may be the 21st century but there is no shortage of colonial-era activities on offer in Victoria, B.C. Afternoon tea at the Empress Hotel and horse-drawn carriage rides are just two of the attractions advertised to tourists and locals alike. However, there are visible changes happening in the city that was built on the territory of the Songhees and Esquimalt nations. 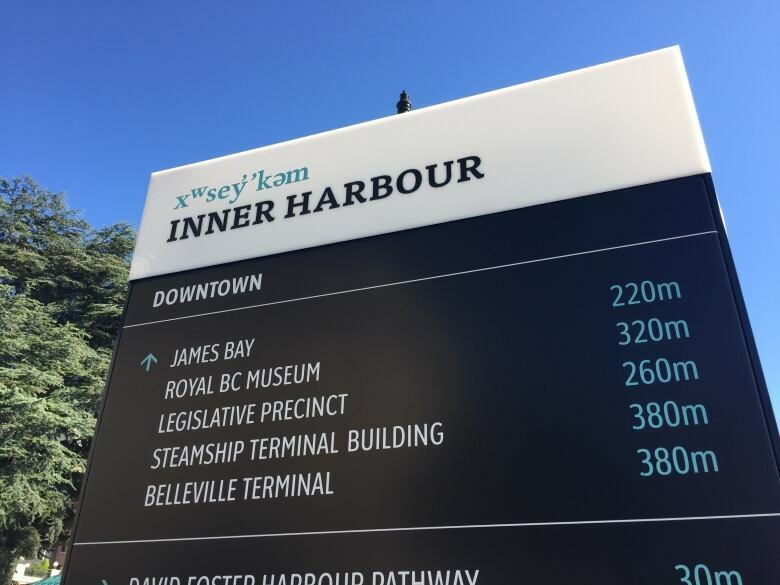 The Lekwungen place name for Victoria's inner harbour was installed in March 2018. (CBC/Jean Paetkau)Wayfinding signs in Lekwungen, the language of these two nations, have gone up around the city. As well, the city's newest library has been named sxʷeŋ'xʷəŋ taŋ'exw, the Lekwungen term for the area. Chief Ron Sam of the Songhees Nation says the Lekwungen place names are a way to acknowledge the ancestors and create awareness that his people are still thriving. City staff reached out to Chief Sam and the late Chief Andy Thomas of the Esquimalt Nation as part of ongoing work on reconciliation. Chief Sam and Chief Thomas encouraged the creation of a City Family. "It's a group of people that were chosen by Esquimalt Nation and Songhees Nation along with City of Victoria representatives," Chief Sam said. "Family is a term that kind of comes from both communities." The naming of the library was one of the first projects for the City Family. sxʷeŋ'xʷəŋ taŋ'exw was chosen by Dr. Elmer Seniemten George and Edward Thomas of the Esquimalt nation. 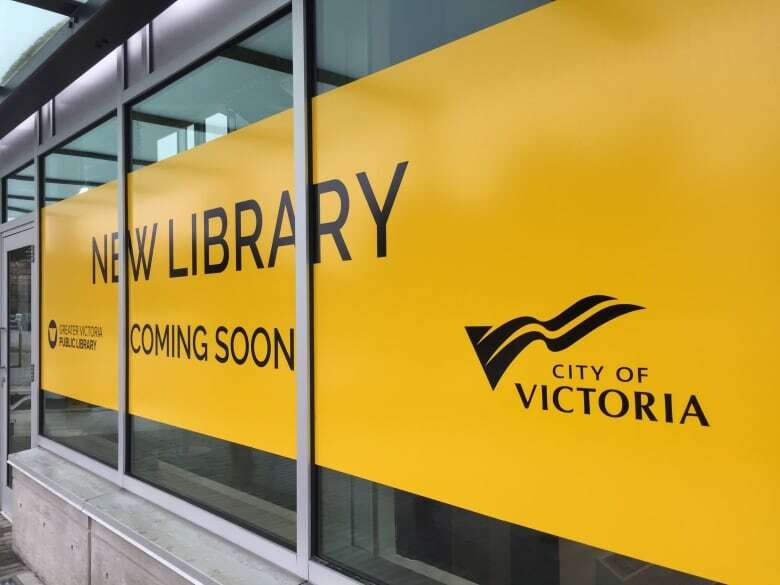 One third of suggestions from the public were for an indigenous name for the new library. (CBC/Jean Paetkau)Dr. George is one of the few fluent speakers of Lekwungen. "I just know he was very honoured to be able to provide language and names to a building here in Victoria," Chief Sam said. Lisa Helps is the mayor of Victoria and part of the City Family. She wanted to dedicate 2017 to reconciliation..
"What Chief Andy said is, 'This your work, we'll support you, but reconciliation is your work. You need to reconcile with your history on our lands.'" She said the goal for reconciliation in her community is to increase awareness of Lekwungen culture. "Ten years from now Lekwungen culture will simply be visible in the homelands of the Lekwungen people," Helps said. "That really is part of the naming of the library, it came from that objective, to have visibility, a felt sense of Lekwungen culture and language." However, when it comes to healing and reconciliation in the West Coast community, there is a move to not only add names, but to also remove controversial ones. For example, there is ongoing debate in the city about buildings and streets named after Joseph Trutch. Trutch was B.C's First Lieutenant Governor and in the 1860s he was the Chief Commissioner of Lands and Works. Trutch was deeply opposed to Aboriginal title and he reduced the size of reserves by 91 per cent. The writings he left behind also reveal an caustic, unapologetic racism. Blake Desjarlais was the elected fire keeper for the Native Students Union at University of Victoria when the controversy over the Trutch student residence came to a head. He said seeing controversial names like his on campus is very painful. "We seek to be not hypocrites in these spaces. We seek to be accountable in these spaces. We seek to share knowledge more openly in these spaces," Desjarlais said. The Trutch name was finally removed from the student residence in 2017, a decision that Desjarlais described as "vindicating". However, removing controversial names isn't the only approach taken by people committed to reconciliation in Victoria. Carey Newman is a Kwalgiulth artist whose heritage is also Salish, English, Irish and Scottish. Newman said that truth must come before reconciliation, and that even applies to controversial names and statues. "Some people want to tear everything down," Newman said. "I think maybe there's times when things should, at the very least, be moved. But I think that, other times, there's a place for recontextualizing things." Newman is concerned that if you remove controversial statues, like the one of Sir John A. Macdonald outside Victoria's city hall, then it will be easier to forget the effect that colonialism has had on Indigenous people. "I think if we create something to challenge those names, to challenge those monuments, then we're taking on the truth of it, and we are taking it face on." Newman says it has been interesting to watch how the City of Victoria has approached reconciliation. "With its very colonial past, tea at the Empress, all those kinds of things have played into this conversation around reconciliation. They have been very open and have come to the table with more questions than answers and I think that is a good way of approaching it." 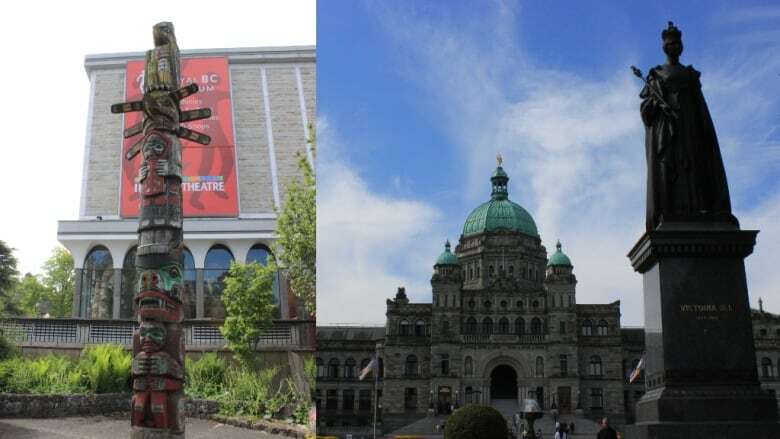 FULL EPISODE: Unreserved visits Victoria: Can a city rooted in colonial history be a progressive site for reconciliation?